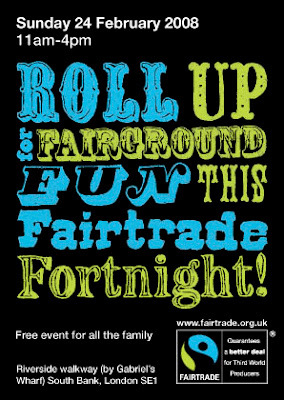 It's Fairtrade Fortnight - Roll Up! Roll Up! So it's the first day of Fairtrade Fortnight. Let us know your Fairtrade happenings and reports from your events. Or even the responses you get from shop keepers when you request Fairtrade products. Use the email address info@fairtradeleigh.org.uk to contact us of the comments box on this post. Hey! for those of you Leigh people that commute to London every day - did you check out the Fairtrade Fornight Fun Fair. It would be great to hear what it was like. Did you visit with your friends, work colleagues or families. Why not write a review in the comments box below or email us.